A first-time parliamentarian from Nagaur in Rajasthan, C.R. Chaudhary is a well-known figure in Rajasthan and one of the biggest Jat leaders in his constituency. He started his career as a teacher in a college and went on to become the chairman of the Rajasthan Public Service Commission (RPSC) before joining politics post-retirement. Before winning the Lok Sabha polls in the 2014 general elections, he also staked claim to a Rajya Sabha berth. 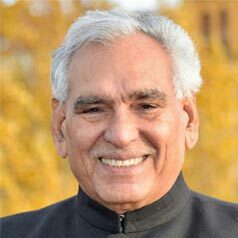 From September 1, 2014, he has been a member of several parliamentary panels: Committee on Subordinate Legislation, Standing Committee on Human Resource Development and Consultative Committee attached to the Union Ministry of Road Transport and Highways and Shipping. He is a postgraduate in Geography from University of Rajasthan and later went to the UK for training in rural development issues.